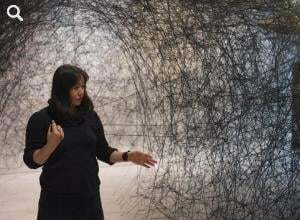 Chiharu Shiota, born in Japan, has a studio in Berlin's Prenzlauer Berg district. Her work is devoted to the great themes of humanity, and her installations and performances highlight the themes of remembrance, home, fear, birth and death. Her installation The Key in the Hand, which she showed in the Japanese pavilion at the Venice Biennale in 2015, met with great success. Her expansive, web-like creations, which are at once overwhelming and fragile, have gained her international recognition.